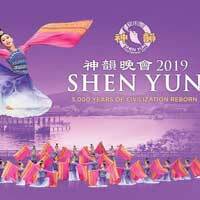 World-famous performing-arts troupe Shen Yun summons an ancient Chinese world to vibrant life via traditional music, dance and acrobatics, along with spectacular animated backdrops, historically authentic costumes and thunderous orchestral sound. Their latest exciting stage extravaganza, Experience a Divine Culture, stars a cast of 100 in a wildly colorful, exhilarating and heartfelt journey through 5,000 years of glorious civilization, now on the verge of disappearing completely. You'll see more than a dozen dance pieces, each with its own story, as well as several solo vocal and instrumental performances as part of the show Broadway World calls "extravagantly beautiful," when it arrives on stage at Dorothy Chandler Pavilion in Los Angeles.